We’re heading west to Perth this morning, to get to know Constanza Herrero, who’s just released a new self-titled EP. But this isn’t Constanza’s first foray into the music business. Not by a long shot. As you’ll read below, she’s got an incredible history, a pop band past and possesses an amazingly diverse musical palate. You’ll also get to listen to her new EP. So join us as we get to know Constanza Herrero in our latest feature. 01. Name : Constanza Herrero. 03. How did you get your start in music? Since I have memory that I’ve been loving music. As little girl I joined choir and started having singing lessons. But it wasn’t until I started writing my original songs as a teenager when I realised that I wanted to pursue music for the rest of my life. At the age of 15 I released my first EP under my artist name at that time “Kota”, and then I joined the Chilean pop band winner of an MTV LA Award called “Six Pack”. 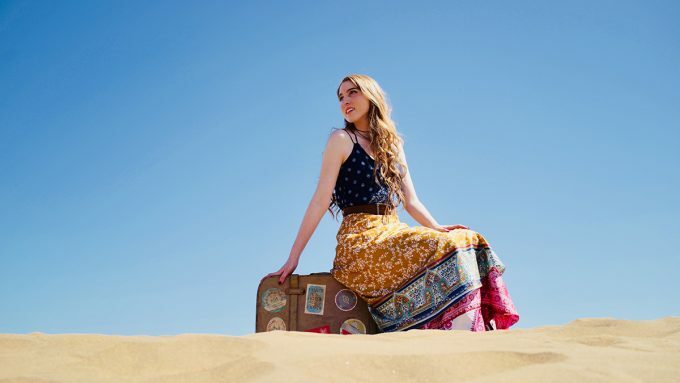 After finishing high school, I moved to Australia to study my Bachelor of Music at the Western Australian Academy of Performing Arts (WAAPA) and now after graduating I am pursuing again my career as a solo independent artist. 04. Give us five words to best describe you as an artist. Honest, sensitive, consequent, passionate, multicultural. 05. Tell us a little bit about your sound and how it developed. The sound of my music reflects my multicultural background. It has developed very naturally as I let myself to embrace proudly the different styles that have influenced me in my life and wanting to bring something new that’s honestly crafted to the music scene. In this EP you hear a fusion of pop, folk, soul and latin-jazz. 06. What’s your earliest musical memory? Singing and dancing in the living room of my house along to this kids TV show back in Chile. Also being part of my school and church choir. 07. Who have been your musical influences? So many! But to keep this answer short, let’s just say the ones who influenced more my latest EP. I would say Esperanza Spalding, Joni Mitchell, Stevie Wonder. 08. What are your favourite songs of all time? I have a few but these ones are the ones that have impacted my life in a very personal way : ‘Amazing Grace’, ‘Bohemian Rhapsody’, ‘A Case Of You’, ‘Time To Say Goodbye’. 09. Where’s your favourite place to listen to music? In my car. Happy : Latin American dance music. Aartists such as Juan Luis Guerra or Shakira, or my guilty pleasure playlist with all the ’90s and ’00s pop artists. Sad : Inspirational songs by Brooke Fraser or Sara Groves. Introspective : Folk music, Joni Mitchell, Sufjan Stevens, Angus and Julia Stone. Exhausted : Some jazz standards artists like Ella Fitzgerald. 12. Give us a little fun fact about yourself that people might not know. I am very clumsy, always spilling off things. Although in the end that always ends up being more fun for others than for me. 13. What would your chosen career be if music wasn’t an option? Probably journalism. 14. What’s the best advice you’ve been given in your career? To stay true to myself and not compromise my values even if through that way it will take me longer to get where I want to. 15. If you could trade places with any artist in the world right now, who would it be? This would be fun! Esperanza Spalding. It would be fun to know how it feels to be insanely musical as she is, and playing double bass and sing at the same time like she does! 16. Tell us about your latest release. My latest self titled EP counts with five original songs and a bonus track of the lead single ‘Packing Up’ sung in Spanish. Influenced by a multicultural influenced sound and lyrically by society issues and personal experiences that urges me to talk about with the purpose to encourage those who will listen to my songs. I had the blessing to record with musicians that have worked with household names such as Stevie Wonder, Shakira and Celine Dion. You can find all my songs in the main digital platforms and you can check out the very new music video of my song ‘Packing Up’ on Youtube, which I filmed in my native country Chile. 17. What do your future plans involve? I am planning to go to the US to show my music and play there. For now I am focusing on promoting my EP and my new music video, alongside writing new songs and continue growing as an artist. 18. Where can our audience catch you live? I will announce soon the confirmation of my next performance. Please follow my social media to stay tuned with my career.